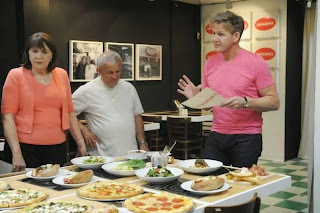 In this Kitchen Nightmares episode, Chef Gordon Ramsay visits Pantaleone's pizza in Denver, Colorado, owned by Pete Fafalios and wife Paulette, who have owned the restaurant since 1985, at first it had rave reviews and local awards. Pete is still living in the glory days and the staff say the food is terrible. Gordon arrives at the restaurant and meets Pete, Gordon asks him where in Italy he is from and discovers that he is Greek. They explain to Gordon that they don't open on Sundays as Pete likes to watch the football and he also takes a nap mid afternoon as he gets tired. Gordon orders a sausage pizza, meatball hero, a calzone and linguine with clams. He is not impressed with the dining room, comparing it to a hospital. Whilst he is waiting for his food Gordon speaks to another diner and asks them how the food is, it tastes like cat food. Gordon's huge calzone arrives but it is cold in the middle. The pizza is also huge, the crust is thick and it is too greasy. Gordon sends it back and Pete says that it is still the best pizza in the city. The meatball hero is no better, Gordon describes this as a diaper full of meatballs. The final dish of linguine and clams, has canned clams and he empties the juice at the bottom of the dish into a glass. Gordon goes into the kitchen to tell them about how bad his meal was but Pete is in denial. Gordon sets up a taste test to see what people think, he has 3 pizzas on offer, one from the best rated restaurant in Denver, one made by Pete and a frozen pizza. Pete's pizza came last with 10%, the frozen had 15% and 75% preferred the best rated pizza. Gordon asks Pete if he would change his pizza and he says no. Gordon takes the family to a family restaurant in Las Vegas. They have a talk, meal and agree to work on their relationship. Gordon gives the restaurant a makeover, he has replaced the wood panelling and the plastic table cloths. The weird artwork on the walls has been replaced with traditional pictures of Italy. Gordon also reveals that he is giving them a van so that they can deliver pizza and the menu has also had a huge makeover. For relaunch night, Gordon gives both Josh and Pete a pre-service morale booster out the back which includes smashing a plate. The pep talk appeared to work as despite a few small hiccups the evening was a success and the diners were very pleased with the food. Trip Advisor and Yelp reviews since Gordon has visited the restaurant are mostly positive and the locals are pleased with the new menu. Westword also gave a very positive review. Planning a visit? Menus and more can be found on their website. Pantaleone's was aired on 11 April 2014, the episode was filmed in July 2013 and is Kitchen Nightmares season 7 episode 2. I'm watching this episode for the first time on BBC America as I write this and all I can say is WOW! I understand pride, but this guy Pete is off his rocker! How can he not see that what he serves is crap. I know that pot is legal everywhere in Colorado, so you know that you are doing something wrong if you can't get the stoners with the munchies in your place. THEY EAT TWINKIES FOR "Pete's" sake. Figure that one out if you can. I ate at Pantaleone's several times in the 2000s. I thought the sausage and cheese were amazing. Haven't been in a long time and was surprised to see them on Kitchen Nightmares. Glad to see they're still in business and am looking forward to going back again.